Long-form Improv performance depends a great deal on the 2-person scene: who are these characters? why are we seeing them? How do they feel about each other? How do we feel about them? These are questions that we need to answer and is the essence of Level 2. In our Level 2 Characters and Relationships class, you’ll learn games, techniques and skills to develop fun, unique and believable characters immediately, in the moment. You’ll practice ways to create and sustain characters in the moment through our “HAPPI”process: Heightening, Awareness, Patterns, Physicality, and Inspiration. You’ll play characters who are both close to yourself and ones much different than you. Much of the time you will be with a partner practicing the techniques and skills that make for a successful scene. You’ll also continue to focus on playing moment to moment–bringing a brick to the scene, not the whole cathedral. There are so many characters inside you waiting to come out and play–let them! Special techniques which look at finding internal motivation, subtext, wants, status, tension and physicality. All of the exercises in Level 2 concentrate on making you a better scene player. Much of the time you will be exploring in pairs the techniques that make for a successful 2-person scene: humanity, relationships, wants, making choices, vulnerability, the flaw, heightening and exploring. This level also requires you to become more analytical of the comic process, so whatever you do on stage is a deliberate choice with the aim of building the scene to a comedic climax. Level 2 is only available as a continuation of the L1 (A & B) courses and therefore has the same age requirements (minimum 18 years). Level 2 is a 7-week course with each session lasting 2.5 hours. All you need to bring with you is clothing that you can move easily in, water, a notepad and pen for notes and an open mind. There will be a showcase as part of our nICCE Community night. 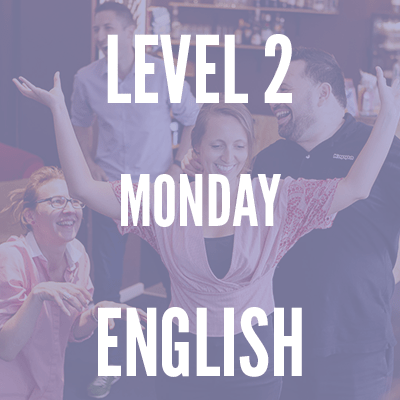 Level 2 is the cornerstone of long-form improv performance. Level 2 equips you with the techniques that you will to make improvising easier. “I had a blast learning from Improv Comedy Copenhagen!